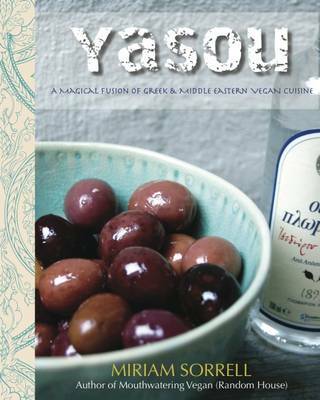 From award-winning chef Miriam Sorrell, author of 'Mouthwatering Vegan' (978-0449015650 Random House 2013, endorsed by Sir Paul McCartney), comes 'YASOU', a magical fusion of Greek and Middle Eastern vegan cuisine.This book connects the author with her own rich roots, and takes plant-based cooking to a new level, bringing the exotic flavours of the Middle East & Southern Mediterranean within easy reach of the home cook, and showing once again the innovative genius of Sorrell as she redesigns vegan cuisine. Taramasalata, Haloumi, Lime Infused Feta, Shaskshuka with genius plant- based Eggs, Baked Fasolia Pie, Middle Eastern Stuffed Cabbage Rolls, Briam-Imam Bayildi, Spanakopita Tart, Crispy Fried Calamari, Aubergine Maqluba, Coffee Creme Caramel, Kalo Prama, and Galaktoboureko, are some of the delights to be found within - all entirely plant-based ! Lavish full page photos accompany each recipe, each one more appetizing than the last, and marking this hotly anticipated book as a historical moment in vegan gastronomy.